and wield your lightsabre in aid of the Rebel Alliance. Harness the most powerful consumer graphics card available today, use the power of the (Ge)Force to subdue your enemy! Featuring the Intel Core i5 8600K Six Core Processor in the stunning, small footprint, Phanteks Shift-X case, finished in glass and Aluminium. The OcUK Gaming Rebellion is designed to be a compact, but eyecatching feature in any living room, bedroom or "man-cave". 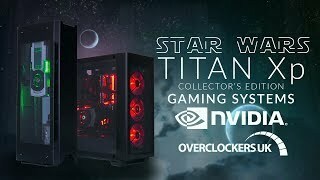 More links for "Rebellion Gaming PC - Nvidia Titan XP Star Wars Jedi Order"